The 90’s decade was a golden one for Bollywood. Many Bollywood movies from the 90s are still popular today and have been granted the cult status among the millennials. When you have your next 90’s Bollywood movies marathon, you can simply pick up a film from our list below and have a great, nostalgic day. Here are 11 classic 90’s Bollywood movies that still have all our love. 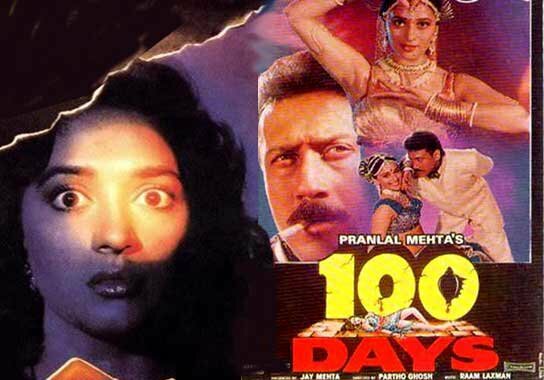 This film is still one of the best horror films of all times, with a good story and some great performances by Madhuri Dixit and Jackie Shroff. The feud between Rajput boys and Model boys is legendary. At the end, when the underdog Sanju (Aamir Khan) beats the rude, pompous Shekhar (Deepak Tijori), you’ll be overjoyed! Directed by Gulzar and starring Chandrachur Singh and Tabu, this film spoke of the Khalistan movement and the unrest among the Punjabi youth. A young boy remembers the wrongdoings of a manipulative employee in his father’s company and avenges his father’s death and mother’s insanity. Shah Rukh Khan is chilling when he says, “Mujhe maaf kar dena, Seema.” Also, Johny Lever has given one of the best performances in this one. The plot was as 90s as they make them. Three orphaned kids lives with their khadoos mama (Aamir Khan). When Vyjayanti, a rebellious daughter from a Tam-Bram family, enters their lives, it is a treat for us audience. Set in Goa, KHKN gives off a nice, vacation vibe. It is a coming-of-age story of a carefree boy (Shah Rukh Khan) to a person who learns to deal with heartbreak and still manages to save the day for his band as well as himself. One of the funniest movies of all time, this one, with all the twisted characters and an equally twisted plot, packs one chuckle too many. If you don’t remember the dialogues already, you should watch this one pronto. Kamal Hassan’s talent needs to approval from anyone. In order to be close to his daughter, Jaiprakash Paswan crossdresses and assumes the nanny’s position. He also tries to win over his separated wife Janki (Tabu). This is easily one of the best made suspense thrillers in Bollywood. This whodunit starring Bobby Deol, Manisha Koirala and Kajol, Gupt left the audience guessing till the very end. This Bollywood gem from the 90s is a story of an ambitious, morally sound ACP (Aamir Khan) who has to take down his idol – an artist from Pakistan. The film was loved by all sects of audiences. Border tells us the heroic tale of the battle of Longewala during the Indo-Pakistani War in 1971. The film stars a slew of talented actors who gave convincing performances and made us proud as Indians.